This speaker is the result of a year of research and development. We tested samples of 5 top selling powered speakers and the RPG series out-performed them all. These go louder and have punchier bass. What we found to be interesting was that some of the other speakers we tested against these were rated by their manufacturers at 1,500 watts or more, but they only went around half as loud as these. The 15" woofer built into this speaker has a 3" aluminum voice coil which provides an extremely loud, deep, punchy bass response. Couple that with our state-of-the-art 1.35'' Japanese made pure titanium-diaphragm compression driver and the ultra-wide dispersion, 40° large-format horizontal wave guide horn and you get beautiful full range concert-quality sound. The linear class A/B amplifier built into these speakers is efficient and provides clean power to the speaker. Some of the competing speakers use cheap amps in their speakers. 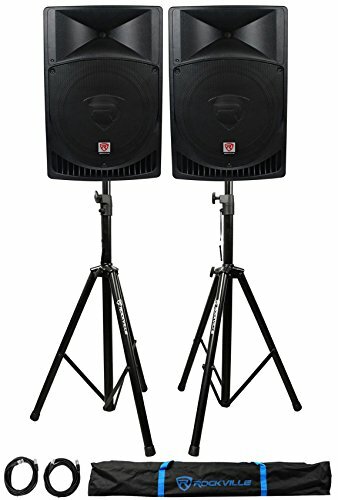 Rockville RPG15 15" Active/Powered 1,000 Watts DJ/PA Speaker System. 250-Watt RMS / 500 Watts Program Power / 1000 Watts Peak. High power long-throw 15'' woofer with 3" aluminum voice coil provides incredibly deep bass and acoustic power. Frequency Response: 35Hz-20KHz. Maximum SPL @1w/1m: 128dB peak / 125dB continuous. High-power 2-way pro sound reinforcement speaker system for live sound and playback applications. Rockville RVSS2-XLR Pair of Adjustable Pro Speaker Stands. Adjustable Height . Steel Construction . Black Color . Weight capacity: 100 LBS . Adjustable Height Range: 47.25-78.75 inches . Base spread: 15-40 inches . Tube Diameter: 1.5 - 1.37 inch . Leg Diameter: 1.37 inch . Includes (2) 20 Foot XLR Female to XLR Male Cables . Includes (1) Travel Bag.